Yep, you read that right Dr. Martens are back. 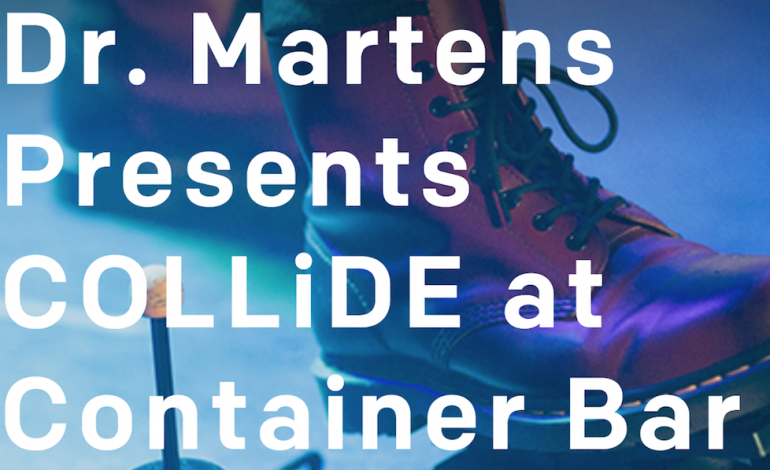 So reach into the very depths of the closet at your parents house for that pair from high school and come out to listen to Collide’s killer line up at Container Bar. For those not familiar with Container Bar, it’s like a grownup hamster cage made from shipping containers, but with booze. Come treat your ears with the with the lengthy 3 day line up in the next paragraph. In one long breath we have, White Reaper, Bully, Porches, THe Qualitons, Soccer Mommy, The Buttertones with nighttime DJs Yultron, Nitti Gritti, Hopsteady and Pixel Terror. Wow, that was day one, Wednesday, March 14th. Let’s keep going with Thursday, March 15th, Kemba, Tinashe, (surpise guest! ), Amy Shark, Weathers, Leikeli47, Gashi, Buddy. Still with me? It’s getting better! 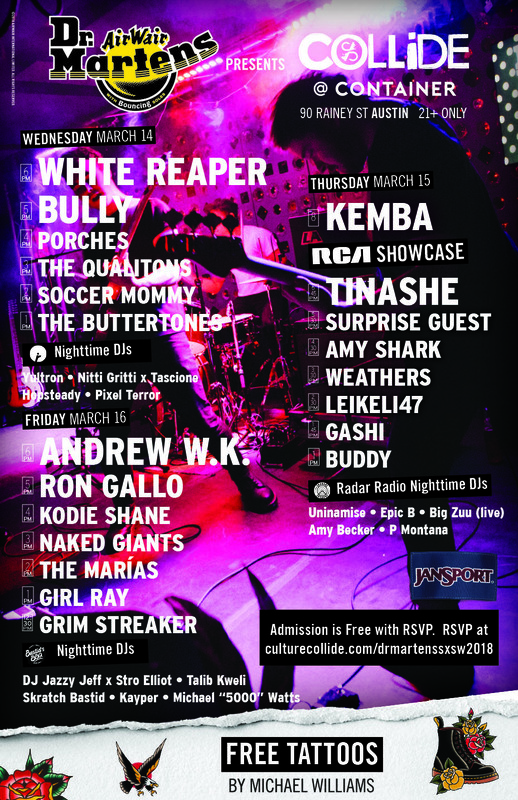 Friday, March 16, we have Andrew W.K., Ron Gallo, Kodie Shane, Naked Giants, The Marias, Girl Ray, Grim Streaker. Nighttime DJ’s include 90’s hip hop legends featuring DJ Jazzy Jeff and Talib Kweli. If you didn’t think this party was hype enough you can walk away with fresh ink from tattoo artist Michael Williams. What are you going to get? Let’s go with some of the our top picks for this show. Andrew W.K. the king of partying is, well going to throw a great party. With is new album titled “You’re Not Alone” dropping March 2nd we’ll have a short time to memorize lyrics. Guaranteed fun. On the other end of the spectrum, we have some not to miss artists like DJ Jazzy Jeff and Talib Kweli. That will be a nighttime DJ set not to miss.